Remember a few months ago when Justin Bieber decided to show off a new tattoo on his ribcage while on vacation in Hawaii with Selena Gomez? Well, fan site www.thejustinbiebershrine.com has released photos of Justin and his father, Jeremy, at the tattoo parlor getting "Yeshua" (the Hebrew spelling of Jesus) inked in identical spots on their torsos. The photos were taken during Bieber’s visit to Israel at the beginning of May. The Jesus tattoo is not Bieber’s first. He has a seagull on his left hip that he received on his 16th birthday, and more recently got an outline of a large star on his left elbow. It is well known that Bieber is an enthusiastic Christian, but the pop singer also has a strong connection to Israel. The 17-year-old says his prayers in both English and Hebrew prior to going on stage. Additionally, Bieber was thrilled to visit Israel during his “My World” tour and found it extremely disrespectful that the paparazzi were bombarding him which visiting “holy places”. On Twitter, Bieber wrote “You would think that paparazzi would have some respect in holy places. All I wanted was the chance to walk where Jesus did here in Israel”. 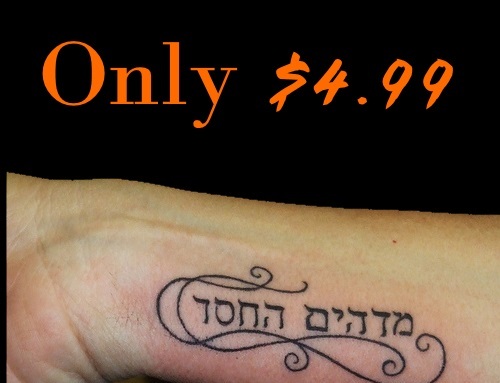 Why Get a Tattoo in Hebrew?